Origin and Habitat: South Africa, Cape province, widespread in a large quadrangular area comprised between Niekerkshoop, Upington, Prieska Kenhardt, and a point 70 km North-West of Upington. Type Locality: 'near Upington, on a low ridge, in quartz' (C059). Habitat: Grows in flat open areas on stony and gravelly soils comprising: pegmatite, quartzite, calcrete, jaspilite and quartz feldspar rocks. Background colours grey-white, grey, brown, pink with some red, black, yellow or grey-brown. 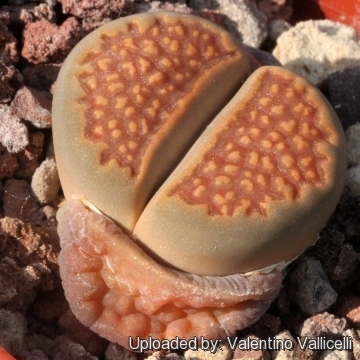 Description: Lithops hallii var. ochracea is a very pretty distinct variety of the variable Lithops hallii and is quite variable too. The names comes from the Latin for “ochre-coloured” (reddish) for its more red-brown, opaque colouration and is distinguished from the type plant by markings on the windows. Habit: It forms small clumps with usually 2-3 heads, but occasionally with up 6 or more heads. Bodies (paired leaves): Medium to large, profile one-shaped, or obconic, truncate, diameter of the face about 20-30 mm. Broadly kidney shaped, top surface truncate, mostly flat, sometimes slightly convex; fissure shallow, 4-7 mm; lobes conjunct. Face flush somewhat reniform; lobes equal-unequal; opaque, slightly rugose. Margins distinct regular to somewhat dentate sometimes with a few peninsulas. This species is fairly easy to identify and shows shades of reddish-brown with regular fine to broad interlacing network of blood-red or brown channels with few or many mostly small islands with scattered dots, dashes and hooks, occasionally with some longer lines forming a broken network and fairly distinct irregularly dentate margins. Windows and channels greenish, red-brown, reddish blue, orange-brown, or brownish grey. Shoulders as for the margins, or lighter, or milky, beige, orange or brownish grey. Rubrications bright to dull blood-red or orange-red. Flowers: The blooms are white, medium to very large, (20-)25-35(-45) mm in diameter. Fruits: (5-)6(-7)-chambered capsules up to 6-10 mm long 4-6,5 mm wide, boat-shaped, top flat to slightly convex. Face narrowly elliptic about 8 x 6 mm broad. Seeds: Light yellow-brown to yellow-brown, smooth and flecked. Watering They Require little water otherwise the epidermis breaks (resulting in unsightly scars). The basic cultivation routine is: Stop watering after flowering. Start watering after the old leaves are completely dry (usually late March or Early April). Water freely during the growing season, soak the compost fully but allow it to dry out between waterings. In the winter season the plant doesn’t need watering, the plant in this time extracts water from the outer succulent leaves, allowing them to shrivel away, relocating water to the rest of the plant and to the new leaves that form during this period. If grown in a container, bottom watering by immersing the container is recommended. Water sparingly only when warm, no water when cold. Nearly all problems occur as a result of overwatering and poor ventilation, especially when weather conditions are dull and cool or very humid. They must have very dry atmosphere. But don't be afraid even the best growers have plants that mysteriously dry up, or leave during the night. Improvement of Lithops characteristics: Some growers (but not all!!) 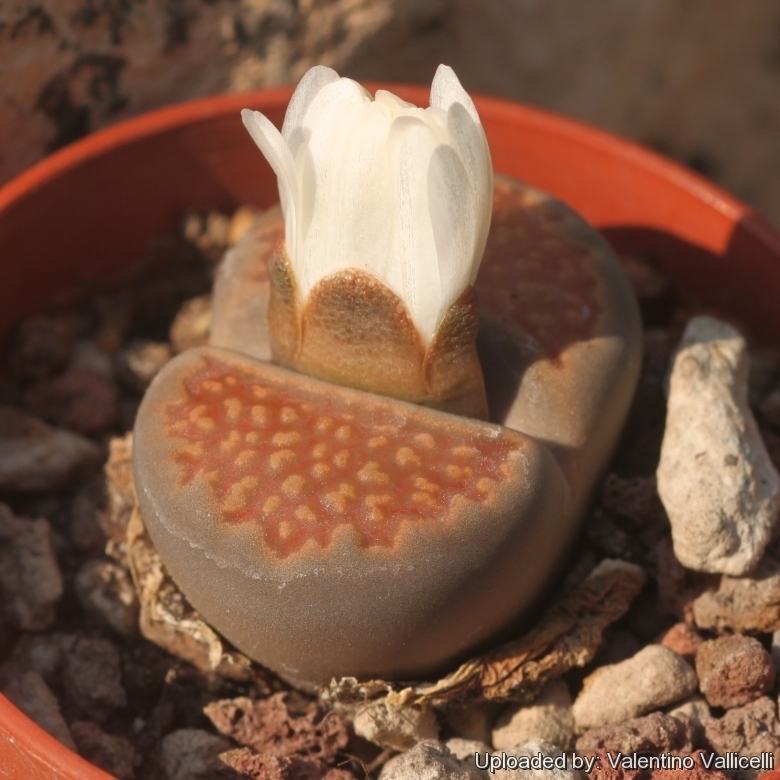 think it is very intriguing to reinforce any characteristic of cultivated Lithops of by crossing two similar selected plants and then back-crossing with the mother plant. This way we can eventually get some interesting results. Of course, many of the nicest Lithops we grow in cultivation have already been selected over time. However many Lithops are already nice plants which can’t really be improved, on the other hand one could try to improve the colour or the markings etc. Now if we have two particular plants we may attempt to breed between them and can maybe get a whole improved population and then select some better offspring to continue the selection.